Thanks to all the commenters; I am still learning how to use computery things... Celeborn considered it verboten in Lorien. I recently learned how to make "commenting" easier on users visiting here, so let me know if it works! It’s time for a lil break from the dailies to have some horse-face time. I like to see the google searches that lead people to Danania.net! Because of my Update 7 comments, I’ve gotten several “Steed of the Jester” looks. Let’s start there. Here is the “Steed of the Jester”. He is obtained via the flower quest “A Fist full of flowers”. 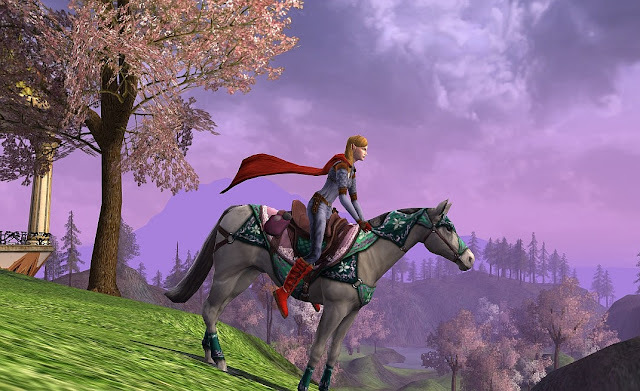 The repeatable quest is found in Bree. The task is to collect many of 3 different types of flowers within an hour and exchange them for gift boxes which *might* contain a steed but probably obtains something silly like clothing dye. Of course, visit Casualstrolltomordor.com to learn details about the quest. Things I've received from the boxes include dyes, lots of "Note of Affection"s, recipes for Tarts and flowers, the Jester, & a couple of Giant Flowers (like the one DanaArodel is holding in Lil Danas). How many gift boxes did it take to get to the tootsie-roll center of the tootsie pop? For me, it was my 51st box. I had done 50 boxes the first 3 days, and the first box on the 4th day was the Jester. The two other winners I have asked: one only took 6 tries, and the other not many more. Your mileage may vary. Given some persistence, this steed seems very winnable. 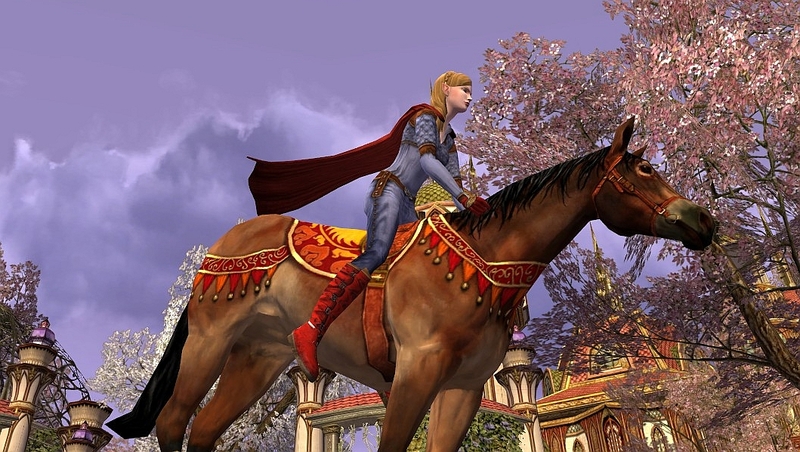 The Steed of the Jester has a speed of +68% & morale of 250, similar to any other high end steed. And certainly, the new Simbelmyne steed is the star of the Spring Festival from Hengstacer Farms. She is a fine grey with lovely turquoise dressing and barters for 2 race tokens, 40 spring leaves, and 200s. 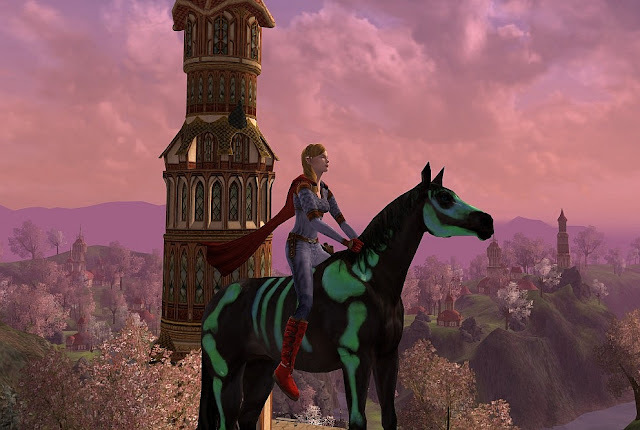 Because it comes up a couple of times a week in google searches coming to danania.net, here is a picture of the Green Painted Skeleton steed. This one was from Fall Festival, only found in the lotro store. (He made an appearance ridden by Batgirl during the Fall Festival post @ Fun Fall Festival). As far as commenting goes - pretty easy for me. I've commented on Blogger-hosted blogs before and I kinda know the drill. Aww. I can feel in Tomeoric!